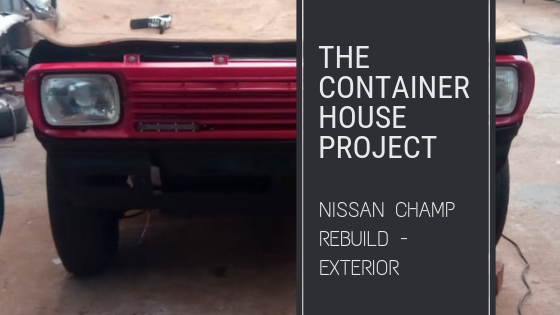 Big projects usually come with glitches and the Nissan Champ rebuild project has been no exception. Kevin and Louis suffered a glitch that resulted in four days of extra work. What happened? And more importantly, what colour did Kevin choose to paint the bakkie? One of our readers suggested that Kevin paint the Nissan Champ in “duck egg”. Personally, I think that this colour would be a fantastic choice and I really think the colour would suit the vehicle too. (Side thought: will Duck Egg coloured towels still be in fashion and available once my new bathroom has been built?) However, we’ve all agreed that the colour isn’t a Kevin colour, especially as he wanted a colour inspired by the Ford ST Orange. Although Ford ST Orange is available to purchase, it’s an expensive colour and one that’s tricky to get right. Therefore, Kevin chose something else; something still pretty amazing. He purchased the paint from Paint Chemistry – a great company very willing to give advice on their products (we are sure we’re going to be seeing more of them as the container house project advances). I would describe the colour as a deep orange that’s bordering on red. Within the paint are gold pearlescent flakes that shimmer in light and give another dimension to the finished product. The gold makes the bakkie look lighter in colour when in the sun, and darker and closer to red in the shade. Quite an unusual effect! Close up of the new colour. Hopefully it doesn’t show up on your device as neon pink as it does on Kevin’s phone! Kevin was very pleased with the paint, but impatiently had to wait for all the body repairs to be completed before they could finally start working with the colour. Prepping for paint is a nightmare of a job. Once all the welding was completed, Louis spent hours and hours sanding down the panels, filling with body putty and sanding some more. Finally we got to the stage where he could start spraying the primer. More sanding and filling, until eventually the white base coat could be painted. Finally, after days of work, the bakkie was ready for the colour paint. It was a momentous day and we planned to stay at work late that evening in order to complete the work. Kevin and Louis worked extremely hard until after 11pm that night. At the end they were exhausted but the colour was on and so was the clear coat. The next morning, Kevin was looking forward to seeing the results of his hard work in the morning sun. We still arrived in Epping early despite everyone feeling tired and over-worked from the previous night’s task. A gut-wrenching realization was awaiting them. Unfortunately, the clear coat had cured with a satin finish and not a gloss finish. As much as I hate to write this, Kevin reckons that the mistake was made due to his own impatience and inexperience with the product (the last time Kevin spray-painted a car was some time ago and products have changed). I would add a good dose of fatigue to the failing recipe, but, in short, the clear coat had been mixed incorrectly. Kevin and Louis were both extremely disappointed. Despondency reigned supreme that morning, because the only way to fix the problem was to sand down the entire vehicle yet again, and spray the clear coat once more. Thankfully, Kevin has some excellent mates, and one in particular jumped right in to help him save the day. By midday, a plan was in place and although the sanding still had to be completed, Kevin had a friend who promised to help him with the final clear coat. The mistake cost Louis and Kevin four days of work, but true friends are priceless; so there are some silver linings to the story. Te (now correct) glossy clear coat has really made the paint pop, now that the paintwork has been completed! With the addition of the painted grill, colour-coded wing mirrors, bumpers, new light fittings and other accessories, the end result is going to be amazing. We’d love to hear your thoughts on the colour. Do you think it was a good choice? Enjoyed this article? Please share! Its going to be a funky little bakkie. What an infuriating experience! Not to mention exhausting. But the bakkie looks fantastic! it does look neon pink! !